The world has fallen to the Rot! 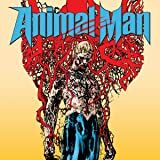 Animal Man, a.k.a. 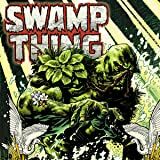 Buddy Baker and Swamp Thing form an uneasy alliance as they find that after facing down the undead forces of Anton Arcane that the world has fallen deep into a decrepit future where the world is consumed into a withering land of decay. The two heroes travel the decimated planet, scrounging up misfit crimefighters, whose appearances and histories have been changed by this new hell-scape. Will Animal Man and Swamp Thing be able to stop the forces of the Rot and change the world back to what it was? 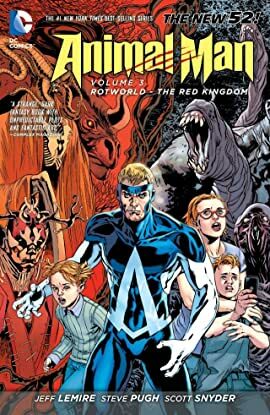 New York Times best-selling authors Scott Snyder (BATMAN) and Jeff Lemire (SWEET TOOTH) team-up to conclude a story that began when the New 52 first launched in ANIMAL MAN VOLUME 3: ROTWORLD: THE RED KINGDOM. Collects Animal Man issues #12-19 and Swamp Thing #12, #17. 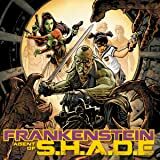 Buddy Baker has gone from "super" man to family man--but is he strong enough to hold his family together when Maxine, his young daughter, starts to manifest her own dangerous powers? Join the Animal Kingdom in this dramatic series from writer Jeff Lemire (SWEET TOOTH) and artist Travel Foreman. This series is rated Teen+. 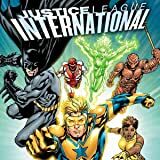 With the growing presence of super beings around the world, the United Nations resolves to create a new group called Justice League International. 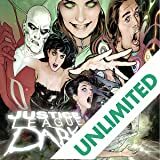 Batman, Booster Gold, Green Lantern Guy Gardner, August General in Iron, Fire, Ice, Vixen and Rocket Red are charged with promoting unity and trust -- but can they reach that goal without killing each other first?